The piriformis is a deep-seated muscle of the buttock that stretches from the top of the femur bone (the large thigh bone) to the sacrum (the triangular-shaped fused bones below the lower back and above the tailbone) on both sides of the body. It helps to secure the head of the femur into the hip joint and is primarily responsible for laterally or externally rotating the femur, as well as abducting this same bone when the hip is flexed (drawing it away from the body). Notably, together, the two piriformis muscles (one on each side of the body) are also responsible for stabilizing the sacroiliac (SI) joints. When too tight or too weak, these important coupled muscles can lead to significant back pain, sciatica or SI joint dysfunction. Because their role is to stabilize the SI joints, when they are weak, they cannot properly perform this function. This can lead to instability and hypermobility within the SI joints, which can further lead to spinal and pelvic instability, potential sciatica and, of course, lower back pain. Yoga is an excellent resource to both strengthen and stretch the piriformis muscles. Because these muscles are coupled (there is one on each side of the body), it is extremely important to stretch and strengthen both sides equally so that no (further) imbalances occur in the body. All standing balance postures work and strengthen the piriformis muscle of the standing leg because it stabilizes the SI joint. With Tree Pose, however, you also get to work the piriformis of the lifted leg. The lifted leg is both externally rotated and abducting (while the hip is flexed), so the piriformis is working many actions of the femur bone. Stabilizing and securing your Tree Pose with your hips level and squared forward will help to strengthen the piriformis muscles on both sides of your body. Be sure to practice this posture with each leg lifted for an equal period of time. 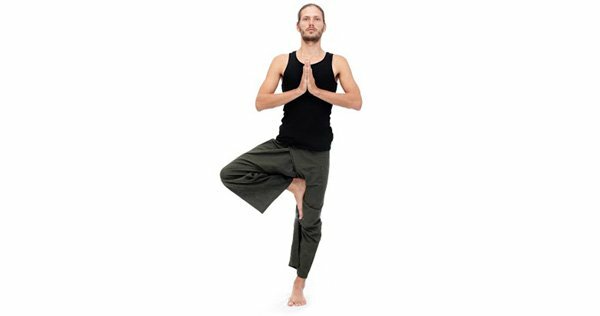 Similar to Tree Pose, Extended Hand-to-Big Toe Pose works the piriformis on both sides of the body. Creating external rotation as well as abduction (while the hip is flexed) in the lifted leg, as well as stabilizing the SI joint on the side of the standing leg, this pose can do wonders to strengthen the piriformis muscles. Again, practice to stabilize this posture with both hips level and squared directly forward. Avoid the tendency to allow your hip to lift on the side of the lifted leg. Stabilize your pelvis and hold for a few long deep breaths, practicing equally on both legs. Chair pose is an excellent pose to strengthen many areas of the body, and the piriformis is no exception when you add the help of props. To practice this variation, make a loop with a yogi strap and wrap it around your legs, landing just above your knees. Tighten the strap until your feet are hip-distance apart with the strap taut. Make sure that your feet and your knees point straight forward and do not sickle in or out. Hug in on your lower belly and sink low into a squat, bending your knees. Sit your hips back behind you so that your knees can (ideally) align over your ankles. You do not need to bend too deeply, just enough to flex your hips so that your piriformis muscles are now working as abductors. From here, keep your spine lengthening toward the ceiling and your knees bent with your seat reaching toward the floor and very actively begin to draw your legs apart from each other. You won’t actually move because your strap is holding you in place but this abducting action will begin to fire up your piriformis muscles equally on both sides. Yoga is a wonderful tool to strengthen, as well as stretch, many, many different parts of the body. Even super deep muscles such as the piriformis can be targeted by the well-balanced practice of asana. The next time you’re feeling lower back pain, strengthening and stretching these pesky, temperamental muscles may provide you with the serious relief you are longing for. Try them out and let us know how it goes!